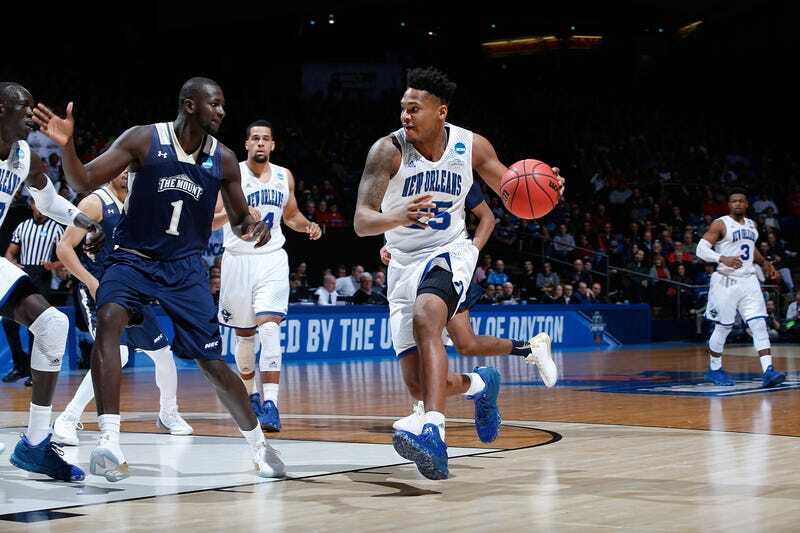 UNO lost by one (which I swear is not intended as a pun) in their NCAA Tournament play-in matchup against Mount St. Mary’s, and there were precisely two highlights, both involving New Orleans’s junior forward Travin Thibodeaux. The first was this big-boy dunk early in the second half in what was a close game throughout. The second was when Thibodeaux, uh, appeared to choke his teammate Christavious Gill during a timeout with 6:36 remaining. Thibodeaux, who finished with 11 points, two assists, and two rebounds, was benched for the rest of the game, and New Orleans probably could have used him down the stretch. Mount St. Mary’s escaped with the 67-66 win after a UNO full-court inbounds pass at game’s end was overthrown. No one’s asking you to care about the play-in games (lord knows I wouldn’t have realized this happened last night if not for the teammate-choking), but as far as the money goes, these are real, actual tournament games, and big deals for the programs and conferences involved. An NCAA Tournament win—those record by Mount St. Mary’s and Kansas State last night absolutely count—each mean a payout of almost $1.6 million for their respective conferences.